Last year’s Pacers were supposed to be a fluke, so how have they become even better? The Indiana Pacers weren’t supposed to be relevant last season. They weren’t supposed to have an All-Star, let alone get the last laugh after they were panned for trading Paul George for Victor Oladipo and Domantas Sabonis. They definitely weren’t supposed to contend for home-court advantage or make LeBron James sweat it out in the first round. That’s why there was an underlying sense of frailty to their success, as if it was a happy accident that would be unmasked as a fluke. Prognosticators had their reasons. Sports Illustrated was skeptical that Oladipo’s sensational season would be his new normal. Indy Cornrows, SB Nation’s Pacers blog, noted that starting point guard Darren Collison was unlikely to flirt with the 50/40/90 club again. ESPN’s preseason power rankings repeated a common critique that they relied too much on unsustainably hot mid-range shooting. Analytics site Nylon Calculus suggested their 11-3 record in games decided by three points or less was a product of luck. Turns out, they were all right. Oladipo has experienced growing pains adapting to increased defensive attention. The Pacers aren’t draining open two-pointers at the same clip as they did in 2017-18. Collison’s numbers are down after he missed 32 of his first 46 attempts from three. While there have been some memorable late-game heroics from Oladipo, Indiana has already dropped as many games decided by three points or less as they did all of last season. Yet the Pacers have somehow improved despite all that. They’re on pace to win 55 games and currently have the fourth-best record in the NBA, all without changing their identity or adding elite talent. So how is Pacers’ seemingly outdated style competing with superteam giants … again? Last year, Indiana was heavily dependent on its new star. They outscored teams by six points per 100 possessions with Oladipo on the floor and were outscored by 8.2 points per 100 possessions with him on the bench. That should have forecasted doom when Oladipo went down with a bone bruise in his knee in mid-November. Instead, something shocking happened to the team’s supporting cast. Not only did the Pacers go 7-4, a vast improvement over last season’s 0-7 mark with Oladipo sidelined, but they also unlocked some previously underused areas of help in his absence. Oladipo’s injury allowed forced young center Myles Turner to emerge from the background, and he’s backed it up by averaging a career-high in touches per game (55.2), points (14.6), rebounds (8.4), blocks (3.0), and field goal percentage (54.0) since Oladipo went down on Nov. 19. On a smaller scale, Indiana made a more purposeful effort to use free-agent signing Doug McDermott’s floor spacing, which led to back-to-back 20-point games off the bench. Collison rediscovered his shot, canning 45 percent on his last 57 threes. All that happened as the rest of the roster kept on chugging. Sabonis, a per-minute wunderkind leading the Sixth Man of the Year race, continued using his 6-foot-11, 240-pound frame to play like a guard as well as a big. Small forward Bojan Bogdanovic is shooting 45 percent from three and has grown more comfortable putting the ball on the floor and attacking from a variety of depths. Power forward Thaddeus Young put on a role-player clinic in key wins over Milwaukee and Philadelphia, leading to him being awarded Eastern Conference Player of the Week. Backup point guard Cory Joseph continues to make a big impact doing the little things, even with his usage and minutes down. Halfway through the season, Indiana has logged 23 games with at least six players scoring in double figures. They had only 26 such games all of last year. Those changes sustained themselves the last few weeks as Oladipo has searched for balance between asserting himself and deferring. The Pacers have won 12 of their last 16 games since Oladipo returned to the lineup, responding equally well when Oladipo saw drop coverage, aggressive hedges, and even box-and-one zone defenses. In a league increasingly geared toward offense, Indiana makes their mark on the less glamorous end of the floor, allowing the second-fewest points per 100 possessions in the league. The Pacers do have a lot of individual defensive talent. Turner is blocking every shot in sight and has become an elite anchor, one the Pacers badly missed during his injury. Young puts the clamps on elite scorers at the league’s most important position, Joseph is a pest at the point of attack, and Oladipo uses his speed to buzz here, there, and everywhere off the ball like a hummingbird in search of nectar. But there’s also something to be said for the palpable trust that pulsates through their system and masks the flaws of weaker links. Their defensive rotations have a mesmerizing quality, akin to the gorgeous ball movement of the San Antonio Spurs from seasons past. That’s why they’re able to be miserly with lineups that seem like they should be a defensive liability. Teams rarely play two centers anymore because they’re vulnerable to getting beat off the dribble by quick guards, but the Pacers have held opponents to just 93.2 points per 100 possessions in the 211 minutes that Turner and Sabonis have shared the floor, a figure considerably stingier than the team’s already stingy defensive rating (103.8). That speaks to the strength of their help coverage. Check out this possession against the Lakers. 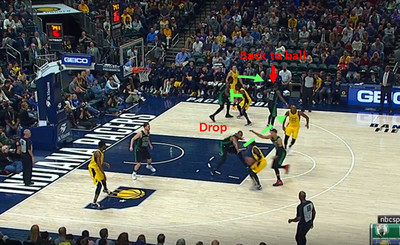 When Joseph got switched onto Lakers forward Kyle Kuzma, rather than stranding the 6-foot-3 guard on an island, the Pacers responded with a fluid chain of sinking and filling that disrupted the drop-off pass and took away the shortest possible kick-out. The biggest takeaway? Neither Sabonis nor Turner was ever put in the position to get blown by on a closeout. Better yet, they don’t just use this connectivity to play prevent defense, as they lead the Eastern Conference in steals, forced turnovers, and points off turnovers. When energized and active, which is basically their default, the Pacers are killing possessions on one end of the floor and converting them into easy looks in transition on the other. That helps mask their offensive weaknesses: they’re 21-6 when they outscore their opponent in points off turnovers, yet only finished with the edge in three-point margin in five of those 21 wins. After having his shot blocked from behind, Oladipo poked the ball away from Blake Griffin. Young then dove in front of an unsuspecting Griffin to recover the loose ball. The cherry on top? The lefty power forward sprinted from the opposite side of the floor to deflect the tapped out rebound out of bounds off Reggie Bullock. That series of hustle plays is like a movie trailer for the full-on Pacers experience. True to form, Indiana won that game by 37 points despite made four fewer threes that the Pistons. Forcing 22 turnovers for 30 points goes a long way. Indiana uses that same reverse psychology on its opponents. It may seem contrary to modern shot trends for the Pacers to be taking 15.5 percent of their shots as long twos (third-highest in the league) instead of getting more threes up (they’re fifth-highest in three-point percentage, but only 28th in attempts), but there is something to be said for aggressively pursuing the shots that defenses tend not to guard closely. Consider this possession from Indiana’s first meeting with Boston. The Celtics have ranked in the top five in opponent 3-point percentage in each of the last 11 seasons, so rather than pursuing more threes, which the Celtics are well-equipped to contest, the Pacers made an already uncontested mid-range shot more open by using the 3-point line as a distraction. Kyrie Irving was so preoccupied with the dummy off-ball screen between Indiana’s top two scorers that he literally turned his back to Turner, who sunk the wide-open 22-footer. Indiana finds ways to overcome the math disadvantage they surrender. The Pacers ended up winning that game by one point because they outscored the Celtics by 25 combined points on twos and free-throws, which made up for getting housed by 24 from three. When the Pacers snapped Brooklyn’s seven-game winning streak on Dec. 21, they did so despite getting outscored by 15 points from three and nine at the free throw line. How did they win by eight? By limiting the Nets to 10 fewer field goal attempts and shooting a blistering 58 percent from two-point range. This isn’t how most teams win, but that’s how they do. Thriving while overcoming less efficient shot selection may also give Indiana an advantage in the postseason. Though Indiana has the 13th-most efficient half-court offense among current playoff teams, according to Synergy Sports, they are well-equipped to throw tough defenses off because they’re not used to defending teams that play this way. 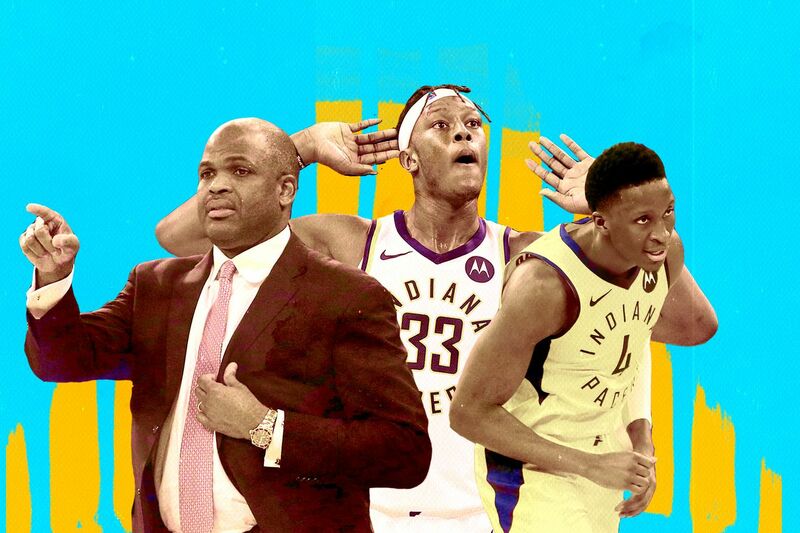 Defying convention, playing outside the box, refusing to conform, whatever you choose to call it, the Pacers are winning with their brand of basketball. They’re not a fluke, and it’s long past time to take them seriously.